SATURDAY BROUGHT A RESPITE from winter. An unbelievable respite as the temperature rocketed to new record highs throughout Minnesota. At the Minneapolis-St. Paul International Airport, the high temp of 56 degrees broke the previous high of 54 degrees set 120 years ago on February 27, 1896. Pulling into the Dairy Queen, I snapped this temperature and time sign on Saturday afternoon, February 27, in Faribault. It was a glorious day. Simply glorious. Here in Faribault, where I photographed a digital temperature reading of 55 degrees at 3:22 p.m., it seemed more a spring day than the middle of winter. Eastbound on Minnesota State Highway 60 in Faribault Saturday afternoon. I spotted motorcycles and convertibles, folks in shorts and shirt sleeves. And in my backyard, the sun shone so bright right after lunch that I wanted to curl up like a cat and sleep. Outdoors. On my back steps. Just feet from snow piles. I set my peanut buster parfait on a table on my patio to show the backyard contrast of seasons. The white background patches are snow, the green is lawn. Hours later, my husband and I were pulling up to the Dairy Queen for peanut buster parfaits. The DQ had just opened and was offering a special. The place was busy. But not as busy as the next door car wash. There vehicles waited a dozen deep in two lines. Randy decided to wash our van and car at home, the old-fashioned way with a hose and bucket of water. This Dairy Queen sign equates the difference in temps from Saturday (hot for Minnesota winter standards) to Sunday (normal for winter). Sunday morning brought a drastic shift in temperatures, to the normal range for this time of year. Thirty-five degrees. Snow flakes fell fast and furious around noon on Sunday. This shows my neighbor’s evergreens and flag, photographed from my back steps. Around noon, a burst of snow reminded me that this still is winter in Minnesota. Even if we experienced a glorious spring-like day on February 27. AT FIRST GLANCE, you likely are questioning my sanity in photographing a semi seemingly headed directly at the vehicle in which I am a front seat passenger. If I did not understand the context of this image taken in October, I, too, would be screaming at myself to get the blank out of the way. This is actually a photo of a semi cab hooked to a cab traveling along Interstate 90 near the Rochester exit in southeastern Minnesota. Now imagine if my husband hadn’t been paying close attention. 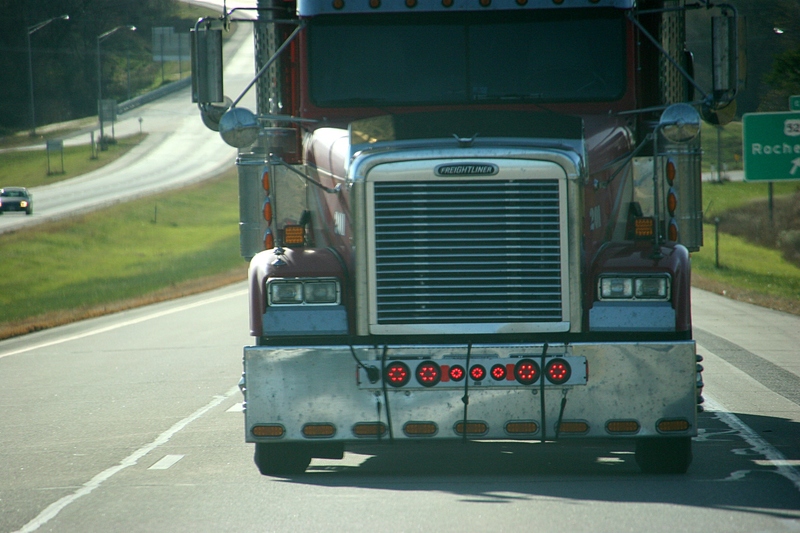 He may have thought the semi was aiming toward us and took evasive action. Thank goodness someone (not me) in our vehicle was fully alert and not fooled by an optical illusion. EVERY BUMPER STICKER writes a story. So what’s the story with the bumper sticker on the right, spotted while waiting at a stoplight in Burnsville a year ago? But, hey, it’s just a bumper sticker, I considered, and opted to focus on the message. The humor clearly works. 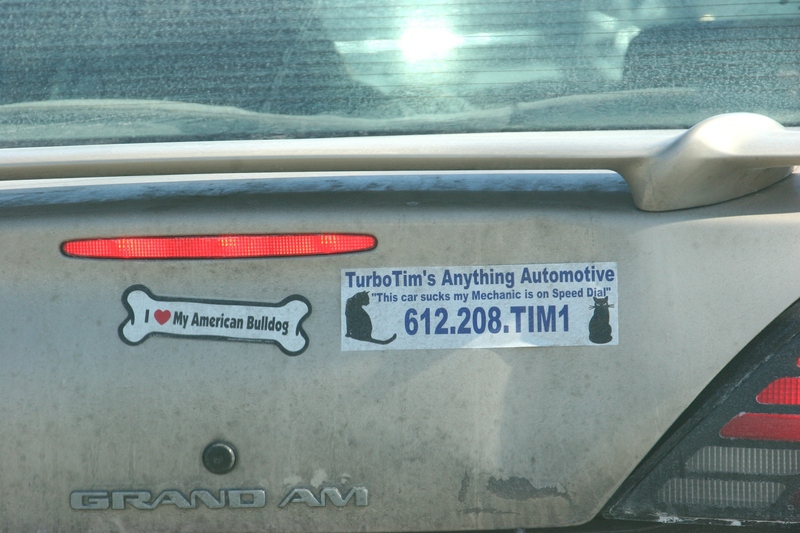 As much as words draw my attention, the cat graphics prompted me to learn more about Turbo Tim’s Anything Automotive. What’s a cat got to do with an auto shop in Northeast Minneapolis? A lot apparently. A black cat, Bibby Bobbie Bibster, according to Turbo’s website, has been a certified Shop Kitty since 2011 and has worked the waiting room for the past three-plus years loving up customers. That explains the black cat. There’s one more thing. Slap a Turbo bumper sticker on your vehicle and you’ll get 10 percent off your bill up to $50 for the life of the car. Based on reviews, Turbo Tim’s seems a customer-friendly place with folks using words like “trustworthy, honest, reasonably priced” and more to describe their experiences. I can’t personally vouch for the service, but have no reason to doubt the testimonials. As for the marketing, I peg it as creative and memorable. HAVE YOU NOTICED any especially creative bumper stickers? Minnesota State Highway 68 near Morgan. Minnesota Prairie Roots file photo 2015. WITHIN SOUTHWESTERN MINNESOTA, I occasionally travel sections of roadway that stretch visually into forever. One is the diagonal of State Highways 67 and 68 running from Evan through Morgan to Redwood Falls. It’s a distance of about 20 miles. But it seems much farther. After years of following a section of that route back to my native Redwood County, I’ve realized that the flatness of the land along a road as straight as a ruler lengthens the distance in my mind. Few farm places snug the highway. Trees stand only in groves sheltering farm sites. As far as I can see down the asphalt ribbon—and it’s a long ways—utility poles guard road ditches in precise vertical lines. And because this roadway angles across the land rather than runs straight north or south, I feel geographically unbalanced. Any sense of direction is lost. That all said, I delight in photographing forever roads like this which draw the viewer right into the scene. It’s as if I am writing poetry with my camera. TELL ME, WHAT SECTION of roadway evokes this same reaction in you? 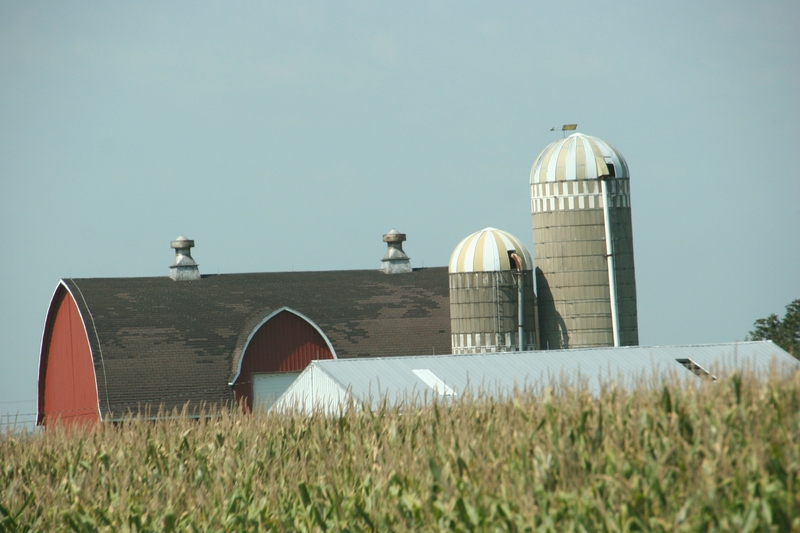 A farm site just minutes east of Utica in southeastern Minnesota. YOU NEVER KNOW what oddities will surprise you in a small town, which is precisely why I delight in exploring rural communities. Utica, a town of about 300 located along U.S. Highway 14 between Rochester and Winona, definitely presented some attractions worth photographing this past September. I use the word “attractions” loosely. What I find interesting may go unnoticed by others. I’m always happy to see a grain elevator that has been maintained and is appreciated. These are small town treasures. 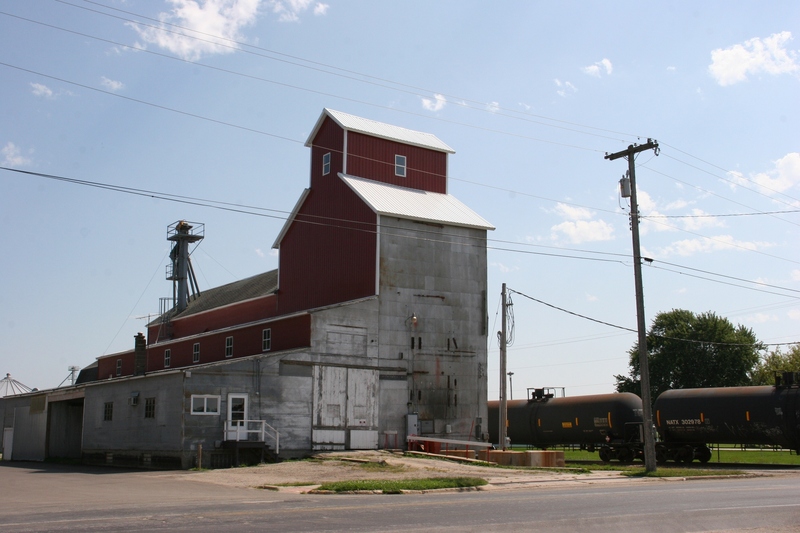 It was the red and grey grain elevator jutting above Utica that drew my husband and me off the highway and into this community as a freight train roared through town. 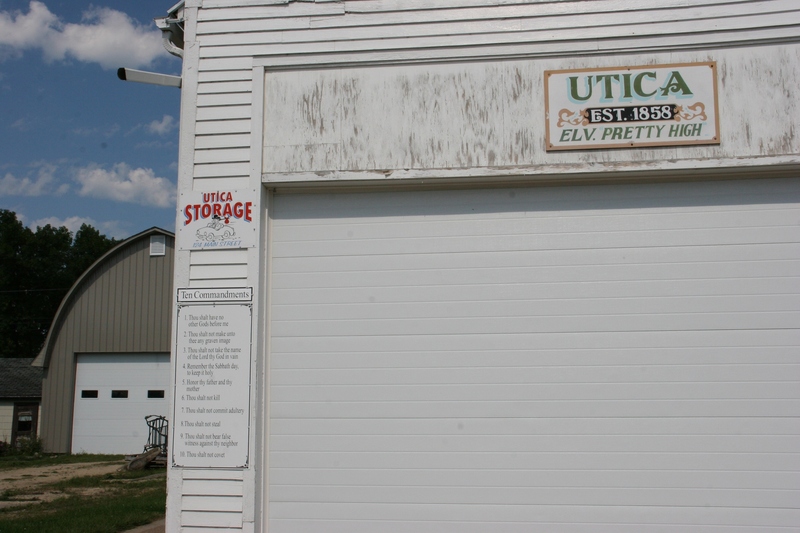 Utica may not have a website, but it has this sign to tell you a bit about the town. 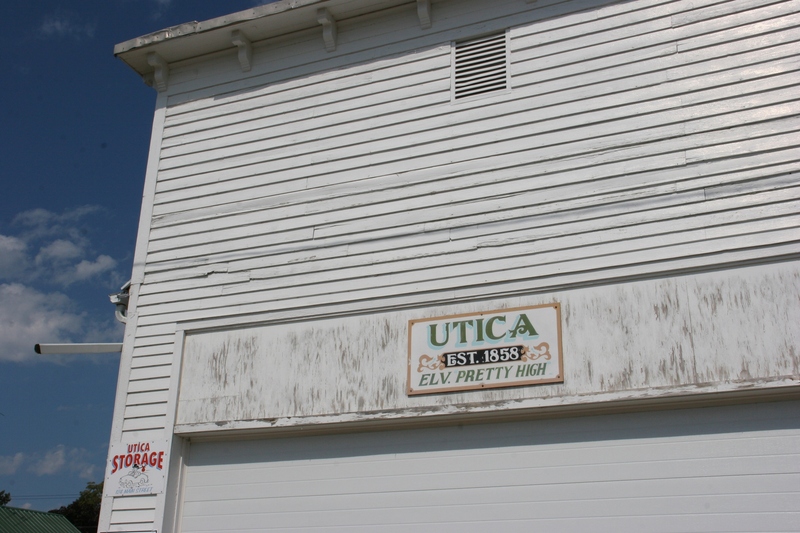 From there we swung onto Main Street and noted that Utica was founded in 1858, if the signage on Utica Storage is accurate. We laughed at the “ELV. PRETTY HIGH” notation. 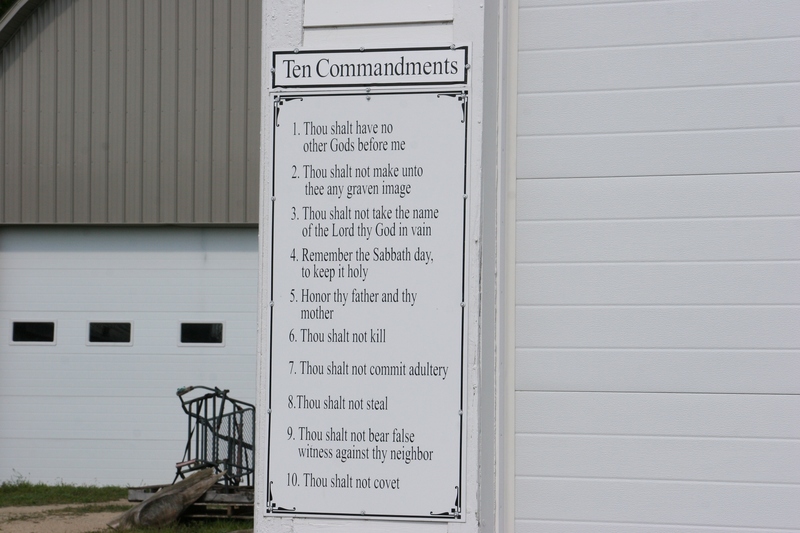 And, if not for Randy, I would have missed the 10 Commandments posted on the front of the building. The “can’t miss it” house. 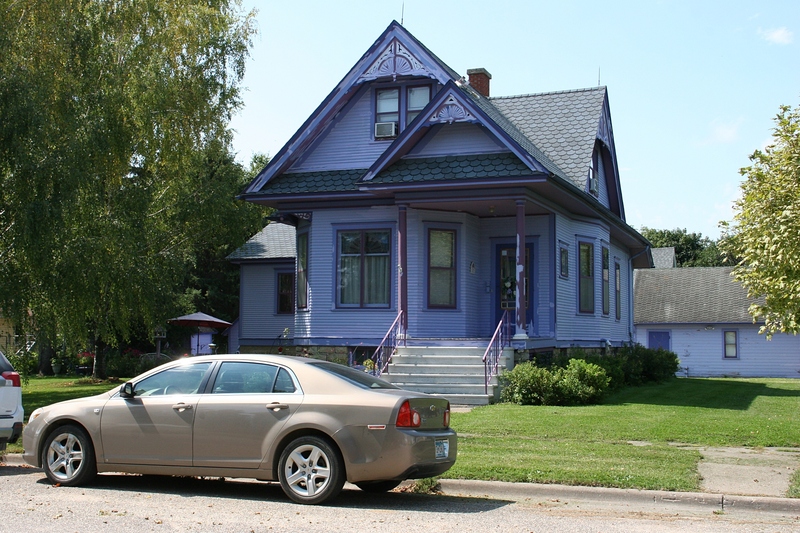 Then, in a residential area, a Victorian house painted in lavender hues presided on a corner. I wondered for a second if it might be a tea house, but saw no such signage. Apparently the owner just really likes this hue given the outbuildings are also painted lavender. This reminded me of my Aunt Marilyn, whose house is not lavender, but who loves the color. And I once worked with legendary Northfield News editor Maggie Lee, who wore only lavender. Utica is definitely a farming community. 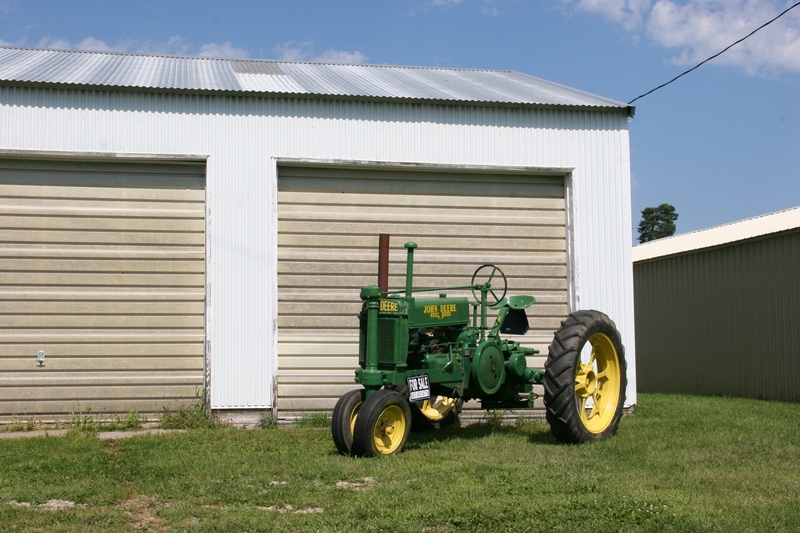 Utica’s final attractions were two tractors—a wonderfully restored John Deere and a rusting Farmall—staged for sale outside a shed. Now, if we’d taken the fast route home via Interstate 90, we would have missed all of this. Utica would remain just a sign along the interstate. I would know nothing of its character, its individuality, its colors. “HOW ARE YOU?” I dislike that question. It’s trite and mostly a meaningless nicety. Does anyone really want an honest answer? When I’ve failed to respond with the expected “good,” eyes shift downward, feet fidget, uncomfortableness wedges in. What if I’m not good? What if life isn’t great and fine and wonderful? Then what? I will tell you I’m OK. And, if you’re listening, you may pause. Worry may fleet across your face. But, if you’re like most people, you won’t push. You’ll walk away. Recently I told a friend I didn’t like the “How are you?” question. So now, whenever we see each other, she says, “It’s good to see you.” I like that. Those words are warm and welcoming and, because I know my friend, genuine. Perhaps we all ought to try being a little more genuine with one another. Caring beyond casual surface conversation. Picking up on cues that maybe everything isn’t alright. And then, listening. Really listening. If you ask the question “How are you?”, ask because you truly care. Not just to make polite conversation. The former Weaver Mercantile anchors Weaver. MY KNOWLEDGE OF WEAVER is limited mostly to visual impressions. Digital images taken during a brief stop last September document an unincorporated Mississippi River settlement rich in history. That history reveals itself in aged buildings, like Weaver Mercantile. Weaver United Methodist Church with an historic former schoolhouse next door. A block or so away, Weaver United Methodist Church still welcomes the faithful into the congregation’s original house of worship. Except on Sundays when the temperature plummets to 10 degrees below zero or colder. The church building maintains its historic charm with modern touches, according to the church website. Indoor plumbing was only just installed in 2008. The old schoolhouse is painted a lovely buttery yellow. Next to the church rests a lovely 1910 one-room schoolhouse, restored in 2008 by a couple for use as a get-away cottage and a weaving studio. An unidentified building near the schoolhouse. And then there’s an aged boxy building topped by a cupola. Perhaps a former creamery? Even the schoolhouse bell tower was restored. Places like Weaver—home to about 50 residents along U.S. Highway 61 north of Winona—intrigue me. I am always pleased to discover such settlements where remnants of history remain in aged buildings. I long to step inside these buildings, to open front doors like I am opening a book of stories.